Our friends in the Lisson Grove Choir are desperately looking for a bass or two to sing with them at tonight’s carol service and Midnight Mass, following a last-minute cancellation from one of their regulars. They’ll be singing some really great stuff, including Palestrina‘s double-choir Missa Hodie Christus natus est and Videte miraculum by Tallis, along with some Willaert and Lassus, plus more up-to-date numbers from Poulenc and MacMillan. Rehearsal is at 8.30pm, carols at 10.45pm and mass starts at 11.30pm. They’re a friendly bunch of singers so if you are a confident bass and can help them out then get in touch with them via this link or drop me a line below with your e-mail/mobile details and I’ll pass them on. Posted on December 24, 2016 December 24, 2016 Leave a comment on Bass emergency! Last night we had a rollicking time at our final singing shindig of 2016, the Counterpint in the Cafe Christmas Special. It was great to see so many of you willing to give up an evening just before Christmas to squeeze into Travelling Through’s cafe for our seasonal singalong! Just about everything we tried proved to be a hit and I am very glad that we are putting Gumpelzhaimer‘s music back in the spotlight where it belongs! Other top numbers were the arrangements of In Dulci Jubilo by Paminger, Gesius and Bach (long-time PDtP followers will know that I have a deep and abiding love for this carol), Palestrina‘s utterly charming Alma Redemptoris Mater, the grandiose Omnes de Saba venient by Gallus and the smashing Viderunt omnes by everyone’s favourite new discovery Zieleński. I was very grateful to you for indulging me in some traditional carols as well – Silent Night and It Came Upon the Midnight Clear were particularly lovely. Thanks to all who came and generously donated to the collection for St Mungo’s – we raised an impressive £140 – and of course thanks again to Travelling Through for hosting us. Before I sign off, I want to let you know that it’s worth tuning into Radio 3’s The Choir at 3.45pm on Christmas Day. 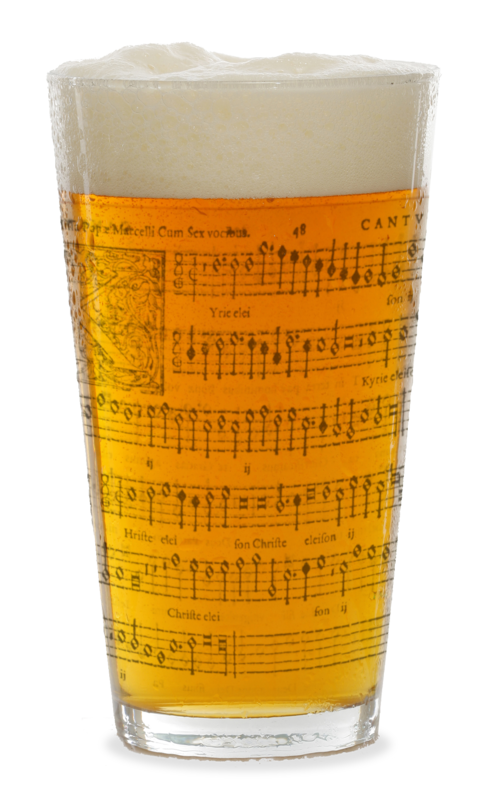 They’ll be celebrating 100 editions of the Meet My Choir segment and they have included Polyphony Down the Pub as one of their highlights. It’s of course a great honour to be included in their Christmas programme for the second year running and it’s a fitting tribute to you all for making this crazy singing club such a success. By the way, listen out too for the Mind & Soul Choir‘s inspiring story – we’re hoping we can link up with them for a session in the New Year. That’s it for the moment – I’ll be in touch again next week for the obligatory Review of the Year, plus some thoughts on the question whither PDtP? ; in the meantime, have a restful, a peaceful and above all a tuneful Christmas! It’s been over a week since our PDtP Christmas Special and I haven’t had a chance before now to let you all know just how fun-packed it really was. I’ll get around to the detail in a moment but I want to let you know first that I’m cramming in one more seasonal singalong, namely a Christmas Counterpint in the Cafe on Thursday December 22nd. We’ll be revisiting seasonal contrapuntal crackers as well as some traditional carols, (mainly because I haven’t had the chance to sing any this year) so book yourself a spot before they all disappear. Over £220 raised for @RoyalVolService at tonight's #PDtPXmas! Thanks for your generosity and hope you all enjoyed the session. And let’s not forget that the next day some of us raised the roof of the Southbank Centre Cafe with a corker of a set. No wonder it’s taken me so long to recover! Thanks to all for coming along last week and hope to see a few of you on the 22nd!